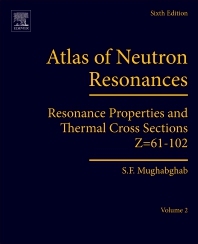 Atlas of Neutron Resonances: Resonance Properties and Thermal Cross Sections Z=61-102, Sixth Edition, contains an extensive list of detailed individual neutron resonance parameters for Z=61-102, thermal cross sections, capture and fission resonance integrals, average resonance parameters, and a short survey of the physics of thermal and resonance neutrons. The long introduction contains: nuclear physics formulas aimed at neutron physicists; topics of special interest such as valence neutron capture, nuclear level density parameters, and s-, p-, and d-wave neutron strength functions; and various comparisons of measured quantities with the predictions of nuclear models, such as the optical model neutron-induced fission. As in the last edition, additional features have been added to appeal to a wider spectrum of users. These include: spin-dependent scattering lengths that are of interest to solid-state physicists, nuclear physicists and neutron evaluators; calculated and measured Maxwellian average 5-keV and 30-keV capture cross sections of importance to astrophysicists involved in nucleosynthesis modeling; s-, p-, and d- wave average radiative widths; nuclear level density parameters; and average fission widths derived from average fission cross sections. Dr. Mughabghab joined Brookhaven National Laboratory in 1963 to carry out neutron research at the Graphite Reactor and later at the High Flux beam Reactor. This was followed by the compilation and evaluation of neutron data at the National Nuclear Data Center. The latter activity resulted in the publications of the well-known BNL-325 reports and Neutron Cross Sections, Volume 1 (4th edition) published by Academic Press (1966-1984); these compendia are frequently referenced in the scientific literature. The former investigations culminated in the findings of non-statistical effects and valence neutron capture in the thermal and resonance neutrons. These activities resulted in collaborative work with physicists at Oak Ridge National Laboratory, Chalk River Nuclear Laboratories, and Harwell. Due to interest in these investigations, the author received international invitations to speak at conferences and neutron schools held at Budapest, Petten, Bologna, Dubna, Bulgaria, and Pruhonice. In the period 1986-1994, the author was involved in the design of a small-size reactor to be utilized in nuclear propulsion for possible future missions to Mars. During this period, the author participated in the analysis and measurements of spallation neutrons. In 1995-2000, the author devoted his attention to the study of the nuclear level density parameters, reported in Physical Rev. Lett. 81,4083 (1998), and the interpretation of average radiative widths of neutron resonances in terms of the Giant Dipole Resonance and within the framework of the generalized Landau-Fermi Liquid model (Phys. Lett. B 487, 155-164, 2000).